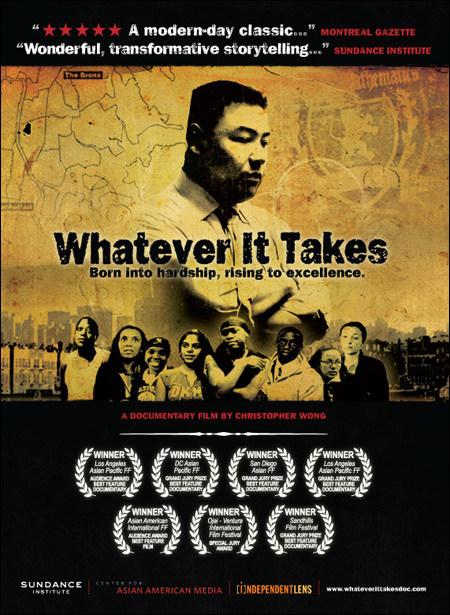 WHATEVER IT TAKES chronicles the struggles and triumphs of the very first year of the Bronx Center for Science & Mathematics, an innovative public high school set in NYC's South Bronx. This deeply emotional, character-driven documentary focuses on Edward Tom, the school's dynamic rookie principal, and Sharifea Baskerville, a talented but troubled ninth-grade girl. The personal stories of this school's students and staff call to mind larger themes of school reform and the need for educators, parents, and policymakers to prioritize the transformation of the public school system so that all children can receive a quality education. Grittily realistic, yet ultimately triumphant, WHATEVER IT TAKES paints a compelling picture of cutting-edge ideas and dedicated individuals, united in their vision to restore hope to a broken community. For a limited time, you can get a discount on your purchase of the DVD. If you sign up for the mailing list. by April 30, you'll receive a special coupon code good for 20% off the retail price. For more information, go the Whatever It Takes website here. And to buy the DVD, go here.